It’s that time of the year again where prices are expected to go down and people are expected to buy stuff. For us PC enthusiasts, system builders and PC gamers, it’s a great time to upgrade and buy new PC components and accessories. It’s also this time around (Q4) when new products are injected into the market for those who want to stay up to date and have the latest and fastest hardware around. For those who are planning to buy or upgrade their storage drive(s) into something faster, like an SSD or NVMe SSD, this is your chance since as we see it prices are starting to go down. Also we have updated this article since there are new, larger (capacities) and better SATA SSDs available; and for those who simply crave for the fastest around, M.2 NVMe SSDs are available to satisfy your demand for speed. During this special season, below are some of our recommended and best SSDs that you should definitely consider; starting from the budget friendly SSDs, to the high performance SSDs, and for the enthusiasts who simply want the best and fastest around. 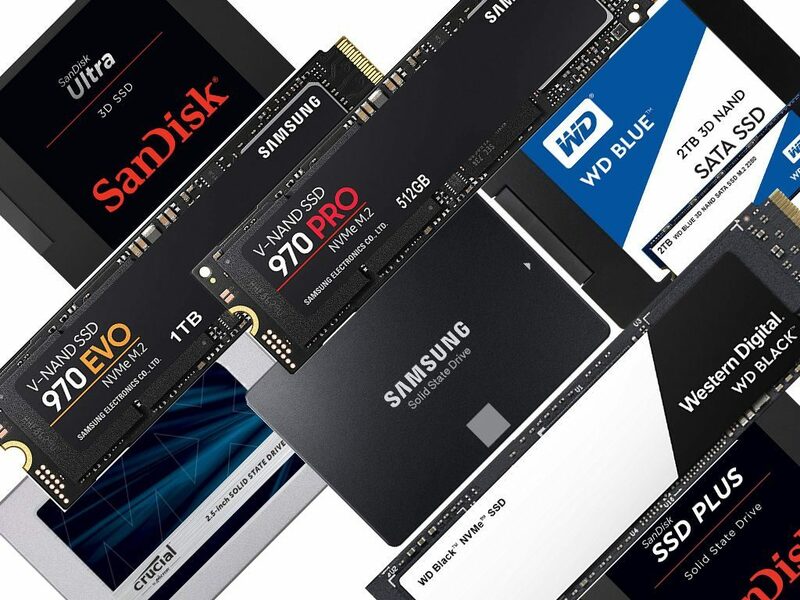 Below are some of the budget friendly SSDs that we recommend. These SSDs may not be the fastest around, but they generally offer a decent speed that is significantly faster than a hard drive. These budget friendly SSDs can reduce boot up / loading / wake up and shut down times, compared to a hard drive. However, compared to the higher end SSDs (below), they may not be as feature rich, has shorter warranty or endurance rating; but they are cheaper and a good place to start for those who just want to make that shift to the fast lane. Note: actual read/write speed is usually or may be lower compared to the advertised speeds. Currently, Silicon Power’s SSD 3D NAND A55 SLC seems to be the cheapest. However, we haven’t tested this SSD yet and we don’t have an actual experience using one. Although it’s the cheapest around, I can’t confidently recommend it. It’s up to you if you want to grab one or not. The SanDisk SSD Plus has been in the market for quite some time. But the company has updated this series and the newer version has the following product numbers: SDSSDA-120G-G27 for the 120GB, SDSSDA-240G-G26 for the 240GB, SDSSDA-480G-G26 for the 480GB, SDSSDA-960G-G26 for the 960GB. Be sure to check out the product number specially the last two digits to ensure that you are getting the latest version of the SanDisk SSD Plus. The SSD Plus features sequential read speeds of up to 535MB/s and up to 450MB/s of sequential write speed. Read/write speeds varies from capacities so be sure to check those numbers. It’s available in 120GB, 240GB, 480GB and 960GB capacities. The SanDisk SSD Plus is available on Amazon.com here. Next is also from SanDisk, the SanDisk Ultra 3D SSD; and from its name alone, this SSD features 3D NAND technology. It offers sequential read speeds of up to 560MB/s and sequential write speeds of up to 530MB/s. It also features NCache 2.0 technology for faster burst speeds. Unlike the SSD Plus, the Ultra 3D offers capacity starting from 250GB, 500GB, 1TB and 2TB. That 1TB or 2TB capacity is great for a game drive; making games load faster compared to when installed on a mechanical disk drive. It comes with a 5-year limited warranty. 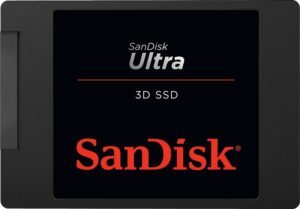 The SanDisk Ultra 3D SSD is available on Amazon.com here. Now let’s move to the solid performing and high performance SATA SSDs. These SSDs are (usually and slightly) faster compared to the entry level SSDs mentioned above. They are also built with more features and usually have a higher endurance rating. This means that under normal circumstances, not only that they should perform faster but they are expected to last longer as well. If you simply want the fastest SATA SSDs around without worrying too much on the cost, consider the following SSDs below. Note: again, actual read/write speed is usually or may be lower compared to the advertised speeds. The Crucial MX500 SSD series is the company’s latest “flagship” or top of the line SSD. It’s fast, but not as fast as Samsung’s flagship SATA SSDs (below). You may want to check out our Crucial MX500 SSD review here. It’s also based on 3D NAND technology and offers sequential read speeds of up to 560MB/s or sequential write speeds of up to 510MB/s. Like the SanDisk Ultra 3D SSD, it’s also available in 250GB, 500GB, 1TB and 2TB capacities. But it comes with features that are not available on budget friendly SSDs. Features like hardware-based encryption, integrated power loss immunity, redundant array of independent NAND and exclusive data defense. The MX500 not only comes in 2.5” SATA SSD form factor, but it’s also available in M.2 form factor. Crucial is offering a 5-year limited warranty for their MX500. The Crucial MX500 SSD Series is available on Amazon.com here. After Western Digital has acquired SanDisk, WD has released their first series of SSD, the WD Blue and WD Green. WD recently updated their WD Blue SSD series, now built with SanDisk 64-layer 3D TLC and features Marvell 88SS1074 controller. The WD Blue SSD 3D is a solid performing SSD offering sequential speeds of up to 560 MB/s read and 530 MB/s write. It’s also more power efficient compared to the previous generation and features an industry-leading 1.75M hours mean time to failure and up to 500TB written for enhanced reliability. It features tiered caching technology and is optimized for multitasking to simultaneously run resource-heavy applications without system slow-down. It’s available in 250GB, 500GB, 1TB and 2TB capacities; and available in both standard 2.5″ 7mm SATA and M.2 2280 SATA form factors. 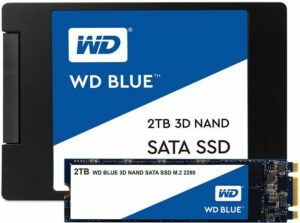 The WD Blue 3D NAND SSD is available on Amazon.com here. The Samsung 860 EVO SSD is perhaps the most popular and must have mainstream SSD currently available in the market. The 860 SSD series is also the company’s latest top of the line SSD series released this year. It’s the world’s first line of consumer SSDs with V-NAND 3bit MLC technology that is paired with Samsung’s MJX controller. It offers sequential read speeds of up to 550MB/s and sequential write speeds of up to 520MB/s; and it’s available in 250GB, 500GB, 1TB, 2TB and 4TB capacity. You can store a lot of data on that 4TB drive. The Samsung 860 EVO also has AES 256-bit full disk encryption, TCG/Opal V2.0, Encrypted Drive (IEEE1667) and features TRIM, Garbage Collection and SMART. One thing that makes Samsung’s SSD better compared to the competition (aside from raw performance) are the proprietary software. Samsung’s Migration software makes it very easy to migrate your files to Samsung’s SSD. Grab a Samsung EVO SSD Series (or two) on Amazon.com here, while it’s hot. Aside from the 860 EVO series, Samsung is also offering an 860 PRO SSD series. The PRO series usually comes with better set of features; like (slightly) faster read/write speeds or longer sustained write speeds, better data protection, longer warranty and more. The Samsung 860 PRO uses Samsung’s V-NAND 2bit MLC NAND flash paired with Samsung’s MJX controller. Its sequential read speeds can go up to 560MB/s and sequential write speeds can go up to 530MB/s. It’s available in 256GB, 512GB, 1TB, 2TB and 4TB capacity and that 4 TB capacity has a Total Bytes Written rating of 4,800TB. It also features AES 256-bit Full Disk Encryption, TCG/Opal V2.0, and Encrypted Drive (IEEE1667). The difference between the PRO and EVO is that the PRO has better endurance compared to the EVO; it’s twice the endurance to be exact. Read/write performance is also better compared to the EVO. However, in real world scenario, you won’t actually feel or see the difference in speed. It’s up to you then if you require the endurance, durability and speed of the PRO has to offer, or go with the cheaper (but also really good) Samsung 860 EVO. 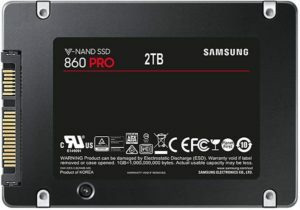 Grab a Samsung 860 PRO SSD on Amazon.com here. NOTE: You must have a motherboard with an M.2 slot that supports PCIE NVMe SSDs, otherwise this will not work in your system. Another option is to use an add-in M.2 PCIe adapter and install it on the PCIe slot of the motherboard. The Corsair Force Series MP510 is the company’s latest M.2 NVMe SSD; featuring Toshiba’s BiCS3 64-Layer 3D TLC NAND flash paired with Phison PS5012-E12 controller. This new SSD can achieve a remarkable sequential read speed of up to 3,480 MB/s and up to 3,000 MB/s of sequential write speed. It’s available in 240GB, 480GB, 960GB and 1920GB. But take note, each capacity has its own theoretical maximum sequential write speed. Only the 960GB capacity can achieve up to 3,000 MB/s of sequential write speed. You can check out more details here. Corsair is offering a limited 5-year warranty for the MP510 NVMe SSD. The Corsair MP510 Force Series M.2 NVMe SSD is now available on Amazon.com here. WD’s latest and fastest M.2 NVMe SSD is the new WD Black 3D (2018). 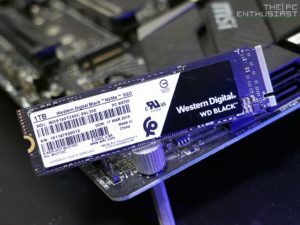 WD previously released a WD Black M.2 NVMe SSD, the one with a Blue PCB, last 2017. Unfortunately, the performance was underwhelming and couldn’t compete with other M.2 NVMe SSDs in the market. Thus, WD made a comeback and released the WD Black 3D NVMe SSD (2018) version, this time with better and faster (SanDisk) 64-layer BiCS 3D TLC NAND paired with Western Digital’s new SSD controller; not to mention a black PCB as well. Finally, an NVMe SSD deserving of WD’s “Black” name. You can check out our review of the WD Black 3D M.2 NVMe SSD here. It offers sequential read speed of up to 3,400MB/s and sequential write speeds of up to 2,800 MB/s. It’s available in 250GB, 500GB and 1TB capacities. This is a really good NVMe SSD and can compete with the likes of Samsung’s flagship 970 EVO NVMe SSD. The WD Black 3D M.2 NVMe SSD (2018) is available on Amazon.com here. Last but definitely not the least, are the Samsung 970 PRO and 970 EVO M.2 NVMe SSDs. Samsung is really good when it comes to making high performance and highly reliable SSD storage solution. The latest 970 PRO/EVO series, first released this April 2018, features Samsung’s Phoenix Controller and Samsung’s V-NAND 2bit MLC for the 970 PRO, and 3bit MLC for the 970 EVO. The 970 PRO is slightly faster with a sequential read speed of up to 3,500 MB/s and a sequential write speed of up to 2,700 MB/s; while the 970 EVO features up to 3,500 MB/s read and up to 2,500 MB/s write respectively. The Samsung 970 PRO is simply the fastest around but it’s also the most expensive one. Most users will definitely opt for the cheaper Samsung 970 EVO. The difference is that the 970 PRO has twice the endurance rating or Total Bytes Written compared to the 970 EVO. The 970 PRO is also available in 512GB and 1TB capacities only, while the 970 EVO is available in 250GB, 500GB, 1TB and 2TB capacities. Both features AES 256-bit full disk encryption and similar data security. The Samsung 970 EVO M.2 NVMe SSD is available on Amazon.com here. While the Samsung 970 PRO M.2 VNMe SSD is available on Amazon here.